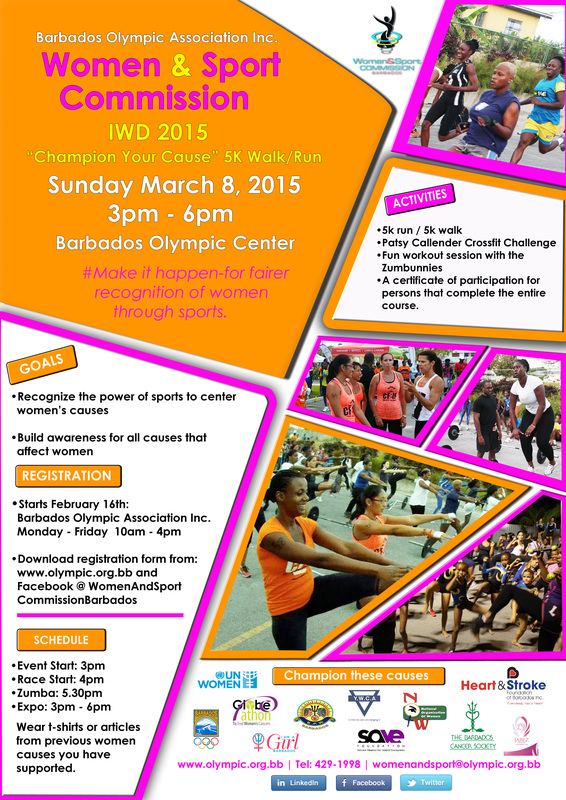 International Women’s Day 2015 Celebrations – Barbados Olympic Association Inc.
On Sunday, March 8, 2015 the Women and Sport Commission of the Barbados Olympic Association Inc. will be celebrating International Women’s Day (IWD) from 3pm-6pm at the Olympic Centre in Wildey, St. Michael. This year’s activities include the “Champion Your Cause” 5K Walk/Run, the Patsy Callender CrossFit Challenge, and a 30-minute Zumba workout. The Women and Sport Commission was formed in 1995 as the Women and Sport Working Group. In 2004, the group became a fully fledged commission that recommends policies to the International Olympic Committee (IOC) aimed at increasing women’s participation in sport at all levels and promoting women in sport. Their aim is to ensure that women are aware of their varied and often unequal realities so that they can make sound decisions as they engage in sport. Come out and participate in the activities on Saturday, March 8, to show your support for our women in sport. Click below to download your registration forms for the 5K walk/run and the Patsy Callender CrossFit Challenge.